According to Fr. 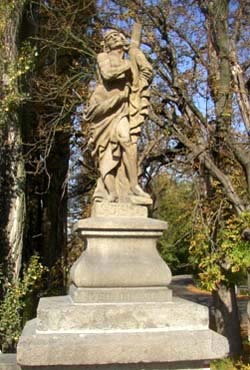 Emmanuel d’Alzon, founder of the Assumptionists, the most beautiful history of St. Dismas was written by St. Anselm in a letter to his sisters meditating on the childhood of the Savior. If this history is at times doubted by modern men, it was nevertheless unanimously accepted during the time of the great Bishop of Canterbury. It was the time of the massacre of the Holy Innocents. St. Joseph, Our Lady, and the Divine Infant were fleeing from Herod. Leaving Bethlehem, the Holy Family entered the land of Egypt, which Sacred Scriptures calls the country of sin where God had withdrawn from His people, a country that only the sacrifice of Christ could redeem. On this flight into the country of the Devil, Jesus, Mary and Joseph entered a forest inhabited by brigands. Among them was Dismas, a murderer and a thief. However, in the depths of his soul lay some secret graces he had not refused. Hidden from sight, waiting for an unsuspecting victim, Dismas saw the approach of a man and a young woman carrying a Child. The three travelers had some baggage, perhaps some of the gifts of the Magi Kings reserved for this long trip. Dismas judged that this unprotected caravan would not offer resistance. The staff of St. Joseph caused him no fear, and he advanced to harm them. However, his eyes fell on the Child Jesus and he stopped, marveling at the glorious beauty and majesty of His countenance. Deeply touched, he protected the travelers instead of harming them, and hosted them in his cave. This was the means Divine Providence used to help the Holy Family, in this instance not with an Angel, but by means of a thief who for a moment was transformed into a good Angel. Dismas offered everything he had, and the Divine Infant allowed Himself to be caressed by that criminal. Upon seeing the respect of the thief for the Child, Mary Most Holy solemnly assured him that he would be rewarded for his action before his death. Dismas continued his life of crime, but he always conserved the memory of that promise, trusting that it would be fulfilled. Nothing is known about the life of this thief during the 33 years of the life of Our Lord. 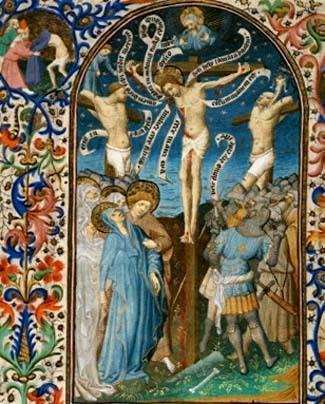 Notwithstanding, he appears along with Gestas, another thief, carrying his cross to be crucified with Jesus Christ. His crimes, however, had so darkened his soul that he recognized neither Jesus nor Mary. The crosses were raised on Mount Calvary, and for three hours Dismas, like Jesus, witnessed the blasphemies of the multitude, which represented the entire world. He also joined in the blasphemies. But Mary, looking at him, recognized him and prayed for him. As the sixth hour approached, the long shadow of Jesus’ cross fell over the body of Dismas. And Jesus said to him: “Amen I say to you, this day you will be with Me in Paradise.” At this moment, Jesus fulfilled the promise made by Mary, and undoubtedly before he died, Dismas recognized Our Lady at the foot of the Cross. The good thief, purified by the sacrifice of Christ, received the first fruits of the Redemption. St. Dismas is considered the patron saint of those condemned to death, of those engaged in dishonest business who would like to make restitution before they die but do not know how, of great sinners and prodigal sons, of those near despair because of irresolvable situations. St. Dismas also assists souls so that they do not die in final impenitence. I believe that this narration of St. Anselm could not be more beautiful and filled with lessons. I think that Fr. d’Alzon is correct when he says that it matters little whether the facts took place exactly as St. Anselm described them. What matters is the moral interpretation of St. Anselm, which indicates how divine grace acts in a soul. Here we have the history of a soul, that of St. Dismas, where a contradiction existed: the man was raised among criminals, receiving the worst possible influences. Nonetheless, he also received the grace to carry out God’s will, because grace is lacking to no one. This soul had gone astray on the bad path; nonetheless, since his childhood, says St. Anselm, he was faithful to some secret graces. St. Anselm presents the history of a man who has sinned much, but in whom God has a mysterious design of mercy and maintains it despite that sin. Thus, we see that he sinned, he committed all kinds of atrocities, but in the depths of his being, he conserved a secret hope that in the end he would repent, be forgiven, and see a new road opened to him. We are shown that ignominious and charming episode of the aggression he plans to make against the Holy Family when he was still a young man. He saw the small caravan – a man and a maiden riding a small donkey and carrying a Child. He calculated it a good opportunity for a theft, and he advanced. But looking at the Divine Infant, he was disarmed, he did not have the courage to carry out his plan. What a beautiful encounter of those two souls! A criminal who looked at the Child Jesus was moved to compassion, when so many others were indifferent. He caressed the Infant; Our Lady thanked him and promised him a reward. 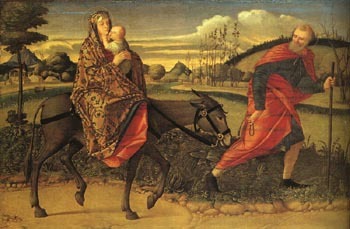 The Holy Family continued on its way to Egypt, and the young man returned to his crimes. And so the life of Dismas continued in this vein until the moment when the hope that burned deep in his heart seemed doomed. He was condemned to death, carried his cross to Calvary, was raised up on it, and that hope of salvation almost disappeared. Did he think about that hope? Perhaps he did, because some graces of hope never abandon a person. Perhaps because of this he was able to correspond at that last moment. In any case, he did not recognize Our Lord at first. Finally, at a certain moment he recognized Him. It is a very poetic picture described by St. Anselm: The light of the sun was miraculously disappearing to signal the death of God, so the shadow of the Cross of Our Lord became longer, falling to the right of Christ’s Cross and covering the body of Dismas. We see that the Church has designated St. Dismas the patron saint of wretched persons. He is the Patron Saint of those condemned to death, which is understandable, since he was one of them. He is patron of those who have engaged in dishonest business and would like to make restitution before they die but do not know how. This is more common than we think. Indeed, we cannot imagine how many people live in comfort and luxury but owe their fortunes to dishonest practices. They wronged others to have such wealth and properties. So, at the moment death approaches, the Church denies them absolution unless they make restitution for their ill-gotten goods. To be forgiven, the man has to face the shame of declaring himself a thief before his family and friends; he also faces the possibility he may yet recover and thenceforth live a life of public scorn and poverty. The Church, who is very maternal in receiving the thief back in her arms and opening the gates of Heaven to him, is nonetheless very demanding about this restitution. Such a man, agonizing between the dilemma of social shame or eternal salvation, has his natural protector in St. Dismas, because he also was a thief. He can be sure that from Heaven St. Dismas is eager to help him. Then, he is patron of prodigal sons as well, that is, of those who fled their good paternal house, the state of grace, ran through their spiritual patrimony, and were ungrateful. St. Dismas looks after them and helps them. He assists those who are discouraged because of irresolvable situations. 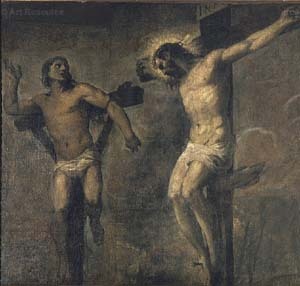 St. Dismas also suffered an analogous thing, condemned and crucified for his crimes. Finally, St. Dismas also assists souls who have recourse to him so that they don't die in final impenitence. If someone has a fear of dying without repenting for his sins, he should pray to St. Dismas. St. Dismas is the symbol of Divine Mercy for all times. Therefore, in our needs and our falls, he can be an encouragement for our poor souls as well.